Today is International Women’s Day which means more this year than ever. Women have been particularly defiant and vocal in a treacherous political climate. These acts of defiance have also been seen from our male allies. 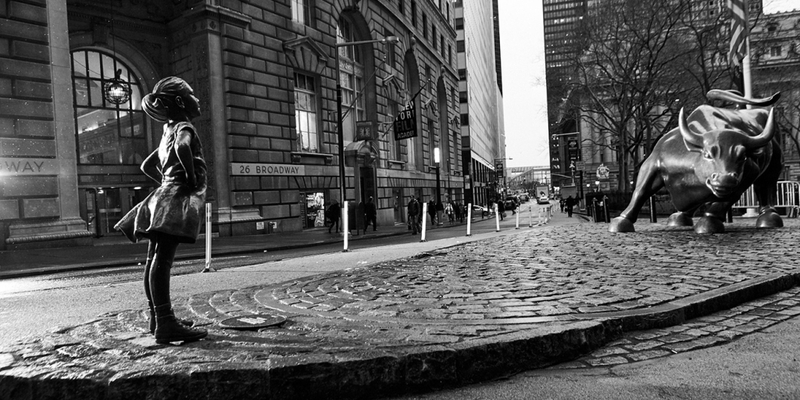 Which is why I was so excited and touched to see this new statute of the “Fearless Girl” posed right in front of the famous Wall Street Bull, sponsored by a predominantly male State Street Global Advisors. This was their way of saying, we hear you, we’re with you and we’re trying to do better. Although McCann (the agency that executed this idea) did get a permit for the statue, it still feels like a gorilla act. This statue represents the future. This girl will grow up to be the next Bill Gates, Steve Jobs, or Neil Degrasse Tyson and I love that she is completely unphased, starring the bull in the face.